bells | Interior Images Ltd. There is always room for a little international conversation piece. 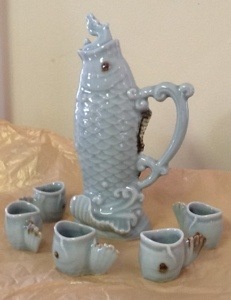 Like a Celadon style Saki set, fish themed, consisting of a decanter (with stopper) and 5 little saki cups. Interestingly, the set has handles – on the decanter (a sort of decorative wave) and each tiny cup (the li’l fishes’ tails). These fish can swim about your cocktail party for $75. Or perhaps you are more of a musical turn? 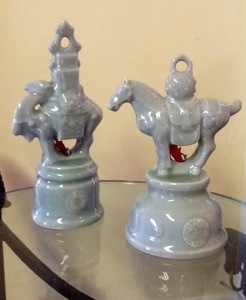 Then glance, I beg, on these two Celadon style decorative bells, representing a camel and a horse, respectively. As each is of somewhat different stature from the other, each one has its own tone when rung. Take them together at $45, or a single bell at $25. I might add, the Celadon blue-green looks very nice on warm-toned wood.